In July 1967 15 pilots met around a table at the Charcoal Inn in Gaithersburg, MD. After that organizational meeting the Inn Flying Club, named after that very restaurant was formed. This not-for-profit flying club has been serving student pilots and pilots in the DC, Maryland and Virginia area continuously ever since. Historically, the Inn Flying Club has owned several Cessna 152s, Cessna 172s, as well as a Cessna 182 and Cessna 207. Currently, they are the proud owners of an IFR equipped Cessna Skyhawk. Each aircraft that has been owned by the club is meticulously cared for by experienced members of the club. Airframe and Powerplant (A&P) mechanics and certified flight instructors are also members of therefore ensuring safe flying through aircraft care and flight training. A popular method for cutting aircraft ownership costs is by simply sharing the expenses. This can be done by getting a partner in the aircraft or joining a flying club like the Inn Flying Club. When someone buys a share in an aircraft partnership or a flying club, the annual aircraft costs are distributed amongst the group, resulting in less out of pocket expenses and more time in the air for the pilot. The Inn Flying club is currently accepting applications for new members! Please visit here to read about the application process. At AIR, we provide a full range of aircraft insurance and aviation insurance products, including Flying Club Insurance. We pride ourselves on finding the insurance policy that best meets the needs of ALL of your members, no matter the size of the club or the type of aircraft. AIR agents believe in serving your flying clubs needs with integrity, by informing the club of all the necessary options to cover your insurance risk. AIR represents all of the major aviation insurance markets, so it is no surprise that we offer the broadest package of protection at the best available rates. To find out more about Flying Club Insurance, please contact Aviation Insurance Resources by calling 877-247-7767 or visit AIR-PROS.com today and receive an Aircraft insurance quote! You can also follow us on Facebook, Twitter, LinkedIn, and Google+. Each day, numerous aircraft provide lifesaving medical transports. Air ambulances transfer individuals out of dangerous situations and direct to a hospital for medical treatment as well as provide comfortable transport for non-emergency patients that require specific care. The NTSB estimates that over 4.3 million individuals have been transported by this method since 1972. According to the FAA, around 1,515 helicopters are operated by air ambulance companies in the United States. These rotorcraft perform around 400,000 transports each year compared to about 150,000 performed by fixed wing aircraft. With industry growth more than tripling since the 1980’s, helicopters have become the hastiest way to save an individual’s life in the case of a medical emergency. Around one third of rotorcraft in the global market are produced by Airbus Eurocopter. Commonly used for air ambulance services, the EC130 and AS350 Ecureuil models offer low operating costs while flying faster and further than ever before. Bell and Agusta helicopters also make up a large majority of air ambulance rotorcraft fleets. For more long range medical services, aerial ambulance programs depend on fixed wing aircraft. Ranging from twin engine, twin turbine and jet propelled aircraft, fixed wing air ambulances provide transport for high risk patients in a comfortable and private setting. In addition to professional air ambulance carriers, many patient airlift charities exist as well. Aviation Insurance Resources (AIR) would like to thank the dedicated professionals piloting air ambulances and the paramedics who treat and monitor the patients in flight. We assist this life-saving industry by shopping all of the aviation insurance markets to provide the best air ambulance insurance rates at the broadest coverage available. To support your air ambulance business, give AIR a call at 301-682-6200 or request a quote online today! One of the ultimate thrills is to jump out of a perfectly good airplane. Since the first parachute jump in 1797 from a balloon above Paris, adrenaline junkies have been depending on skydive business to transport them safely to the skies so they can freefall back to the ground again. For many years skydiving companies have been limited to an individual insurance carrier for their piston single engine skydive operations. Now thanks to a premier partnership between Aviation Insurance Resources (AIR) and Starr Aviation, a more competitive policy solution is available. 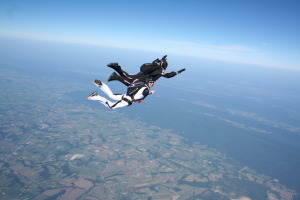 Benefits of this new skydiving policy include: favorable deductibles, higher limits of liability and lower rates. Dive into better aircraft insurance rates with AIR! Serving our fellow pilots for over 17 years, AIR understands the unique challenges an aviation centered business may face. Call Aviation Insurance Resources (AIR) at 301-682-6200 or complete an online request for your skydiving insurance quote today! You can also follow us on Facebook, Twitter, LinkedIn, and Google+. Why is Bruce the Pilot “So Very Happy”? Bruce Jenkins and his wife, Barbara fly a Piper Arrow out of Frederick, MD. Bruce shares with us his history in aviation and how flying and placing his insurance with Aviation Insurance Resources (AIR) has made him “so very happy”. As a product of the World War II generation, I was always interested in airplanes and flying. As a young boy, whenever an airplane would pass over I’d be looking up to see if I could identify it. We lived in the country about 20 miles west of Rochester, NY so there wasn’t a great deal of air traffic and most of it was visible because it flew at the mid-altitudes. There was also the occasional Stearman crop duster to watch on our neighbors’ farms. 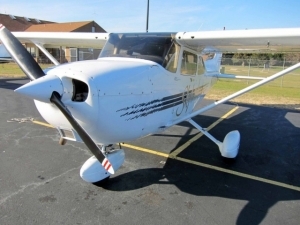 When I attended college I took a few lessons in the J3 Cubs the university owned but never soloed because I couldn’t afford the $6/hour rental. That was the dual rate, wet. Those were the days when everything was about 25 cents: a pack of cigarettes, a bottle of beer, a gallon of high-test gasoline, a bowling game, etc. 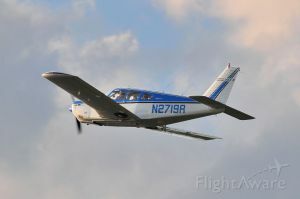 As soon as I could afford it after graduation from Purdue, getting a job, getting married, buying a house, and doing all the things my generation was expected to do I found one of the local flight schools in Rochester, NY and started taking lessons in Piper Cherokees. I later bought a Cherokee 140 with a partner and earned my instrument rating in that airplane. At the same time my wife became interested in pursuing her private license. We then bought our 1969 Arrow in 1976 and have had it ever since. All of our flights to different destinations, especially to the west coast, have been some of my favorites. When you can experience something so different from any experience you’ve previously had, that certainly makes an impression. I also remember some of my flights, usually solo, when the sky was so beautiful at sunrise or sunset that I didn’t really want to land. The best advice I could offer regarding aviation is: “Don’t Wait” If you want to start flying start as soon as you can. If you want to work on additional ratings, start as soon as you can. Because the more you fly, the sooner you add proficiency, the safer you will be as a pilot and the more you will enjoy flying. Are you a current client and friend of ours? We’d love to hear how we have made you “So Very Happy”, too! Are you new to AIR? We’d want to make you happy as well! As fellow aircraft owners, AIR understands your needs and challenges in owning an aircraft and/or aviation business. We are aviation insurance experts, providing a full range of aircraft insurance and aviation insurance products to clients of all sizes. We represent all of the major aviation insurance markets so we can offer you the broadest package of protection at the best available rates. To learn more about the Aviation Insurance Resources, please call 301-682-6200 or visit AIR-PROS.com today to complete an online quote request! You can also follow AIR on Facebook, Twitter, LinkedIn, and Google+. Posted in AIR-Pros News, Aviation Insurance, Client Spotlights | Comments Off on Why is Bruce the Pilot “So Very Happy”?